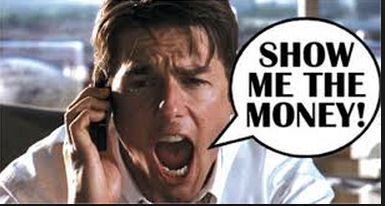 Pearson: Show Me the Money! I dont usually read Education Post. Peter Cunningham, former USDE right hand man, does not share sound public education principles and integrity that I hold dear. So, I dont bother reading the rhetoric that he and his staff write simply because its just that: rhetoric and a complete waste of time. But, an article jumped out at me today that made my jaw drop. I dont think it was intended to be funny, but the irony of it simply struck me with such force that I couldnt stop laughing at Edu Post for printing such malarky and the gall of the author of the piece. The article advances the opinion that tests are necessary for transparency reasons and to measure accountability. But, those of us not so easily influenced by empty statements that are not backed up with facts know that it is the farthest from the truth. Tests are needed for transparency reasons? Are they serious right now? According to COOG and case law: “While an agency is not required to create a new record or provide information in response to questions to comply with the law, “the courts have held that an agency must provide records in the form requested if it has the ability to do so.” http://www.dos.ny.gov/coog/Right_to_know.html But, I digress. NYSED has the info in their files. Yet, NYSED not only failed to respond but they constructively denied the FOIL demand by failng to respond altogether in contravention of freedom of info laws, and its been almost 1 year past due! Given I am involved in a completely pro bono, grass roots effort, I just have not had the opportunity to file a lawsuit against NYSED in court to compel NYSED to turn over the records that I am entitled to, but this must be done apparently in order to obtain information to which we as community members, tax payers and citizens ought to be entitled to without compelling this agency by force of court order! So, at this point, all we have is NYSEDs WORD that the tests measure what they are supposed to measure. No one but NYSED has seen the HumRRO reports. Well, based on their history, NYSEDs word does not stand for much, does it? Pineapple and the Hare ring a bell? So the notion that the state tests measure accountability assure transparency, is a simply empty, false and mind numbing assertion. At a time when standardized tests are secured & guarded with the vigor of top secret FBI docs, teachers are being forced to sign non disclosure agrments promising not to discuss test content depriving them of an opportunity to evaluate whether the test is actually measuring what they are teaching & demands are being made on CHILDREN that they must keep secrets from parents and not discuss tests with parents and peers, I would venture to say that “accountability” is no longer the driving force behind testing our students in public schools. So what drives testing in our public schools? While I dont disagree that standards are needed and ther ought to be measures to tests student achievement for accountability purposes, that is not what is happening in our classrooms today. Standardized tests exist for administrative, political, and financial purposes, not for educational ones. Test companies like Pearson make billions. Politcians get elected by promising better test results. Administrators get funding and avoid harsh penalties by boosting test scores. Everyone benefits except the children. Even Bill Gates admits it. In his speech to the National Conference of State Legislatures circa 2009, Bill Gates outlined a “plan of ac4on” for legislators on how to address educa4on during the economic downturn. Many of these landmark educ policy changes suggested by Gates would be tied to federal stimulus funding and state funding. As to the balance, Gates bankrolled the measure himself. The goal behind cc, is to open K-12 public educa4on to the market place. Education is a commodity to be bought and sold. Common Core developed by business investors with a business minded purpose: to cash in to public educaton, a trillion dollar marketplace. Common Core is the onus for textbook and testing companies to excel at the expense of teachers and children. The Race to the Top program awarded $330 million to two Common Core testing consortium: PARCC and SBAC which are both forced upon schools. Schools must purchase aligned-curricula as well as the technology to run the online Common Core tests. Meanwhile, state is siphoning money away from students who need it (GEA FA Tax cap trifecta). Financially strapped school districts are curng art and music programs, large class sizes and narrowing of the curriculum. 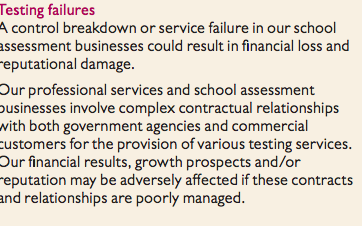 Many schools are facing fiscal and educa4onal insolvency. Charter schools swoop in, private boards comprised of investors profit on the public edu as a commodity. The testing dysfunction is prevalent and disturbing. Students take tests for no other reason than to show Pearson, Gates and their ilk money. The grades 3-8 state testing regimen is not used to better our public schools and it is not helping our students. Tests? They show Pearson the money. If YOU dont want your child to be used as cheap labor to advance an agenda that transcends education, then refuse the test to take control of YOUR child’s education. Edu Post, you’ve been schooled. Next > No PARCCing – Students and Parents Fight Back!